환경운동연합 원전특별위원회는 13일(화) 오후2시 평창 올림픽파크 인근 교차로에서 평창동계올림픽을 맞아 “이제 원전에서 벗어나 안전하고 평화로운 에너지인 재생에너지로의 더 빠른 전환을 촉구하자”라는 캠페인을 열었다. 이번 평창동계올림픽은 평화와 함께 환경, 지속가능성을 목표하고 있다. 이에 정부는 풍력발전소, 태양광발전소 등을 활용하여 에너지를 공급하겠다고 밝혔다. 하지만 올림픽이 치러지는 강릉에는 석탄화력 발전소 건설을 추진하고 전국적으로 5기의 원전이 건설 중에 있다. 환경운동연합 원전특별위원회는 “지난해 11월 15일에는 규모 5.4의 강진이 포항에서 발생하여 아직까지도 여진이 발생해 국민들은 불안해하고 있다”며 “지진대비도 부족하고 안전성이 담보되지 못한 노후 원전은 수명에 관계없이 조기 폐쇄하여 국민들의 불안을 덜어주기바란다”고 주장했다. 참가자들은 이번 평창동계올림픽을 맞아 이제 원전에서 벗어나 안전하고 평화로운 에너지인 재생에너지로의 더 빠른 전환을 요구하고 대기업의 원가이하의 전기요금을 인상하여 전기소비를 줄이는 정책을 강력하게 시행하기를 촉구했다. 평창 동계올림픽이 평화 올림픽으로 성공하기를 간절히 바란다. 대한민국은 25기의 원전을 보유하고 있는 세계 6위의 원전 대국이다. 국토 면적당 원전개수는 세계 1위이다. 그만큼 인구 밀집지역에 원전이 자리 잡고 있어 만약의 사고시 대 재앙이 예상되고 있다. 지난해 고리1호기 가동을 중단하여 폐로를 준비 중에 있어 가동 원전은 24기이다. 평화를 사랑하는 전 세계국가들은 2011년 3월 11일의 후쿠시마 원전 폭발사고를 기점으로 원전을 점점 축소하고 있는 중이며 다행히 대한민국도 탈 원전 대열에 합류하여 지난해에는 계획 중이던 6기의 원전건설계획을 백지화하였다. 그러나 신고리5,6호기 건설을 비롯하여 5기의 원전이 건설 중에 있어 원전 사고 위험성은 전혀 줄지 않고 있어 국민들은 늘 불안해하고 있다. 지진 안전지대였던 대한민국에 2016년 7월 5일 규모 5.0의 강진이 울산에서 발생하였고 곧이어 9월 12일에는 규모 5.8의 강진이 경주에서 발생하였다. 특히 지난해 11월 15일에는 규모 5.4의 강진이 포항에서 발생하여 1,500여명의 이재민과 60여명의 부상자가 발생하여 온 국민을 불안하게 하였으며 원자력 발전소를 걱정하였다. 울산, 경주, 부산지역은 활성 단층지대이며 이 지역에 원전이 무려 19기가 밀집되어 있다. 2011년 후쿠시마 원전 폭발 사고를 기억하는 이 곳 주민들은 원전에 대한 불안으로 고통 받고 있다. 우리는 체르노빌 사고와 후쿠시마 사고를 보면서 더 이상 원전은 안전하지 않다는 사실을 알게 되었고 경제성 또한 재생에너지보다 떨어진다는 사실도 알게 되었다. 미국, 영국, 독일에서 재생에너지 발전 단가는 원전보다 낮아졌다. UAE 알막툼 태양광 발전 단가는 1kWh에 2.6센트까지 떨어져 세계 기록을 세웠다. 대한민국에는 30년 가까운 원전이 8기이다. 지진대비도 부족하고 설비가 노후화되어 안전성이 담보되지 못한다. 이러한 노후 원전은 수명에 관계없이 조기 폐쇄하여 국민들의 불안을 덜어주기 바란다. 재생에너지는 자연이 우리에게 주는 축복이다. 대한민국은 OECD 국가 중 재생에너지 발전 비중은 불과 1.5% 내외로 최하위이다. 재생에너지를 확대하는데 노력을 더해야 한다. 뿐만 아니라 대한민국은 독일, 영국 등의 선진국보다 국민 1인당 전기 소비량은 거의 2배에 가까울 정도로 전기소비가 낭비수준이다. 대기업의 원가이하의 전기요금을 인상하여 전기소비를 줄이는 정책을 강력하게 시행하기를 촉구한다. 절약은 제5의 발전소이다. We, Nuclear free committee of KFEM, hope that the PyeongChang Winter Olympic Games will be successful as a peace Olympic Games. The Republic of Korea is the sixth largest nuclear power plant country in the world with 25 nuclear power plants. The number of nuclear power plants per land area is the largest in the world. The nuclear power plants are located in the densely populated areas, and catastrophe is expected in case of an accident. Last year, Kori Unit 1 was shut down and is preparing to close. The peace-loving countries all over the world have reduced their nuclear power plants since Fukushima nuclear power plant explosion on March 11, 2011. 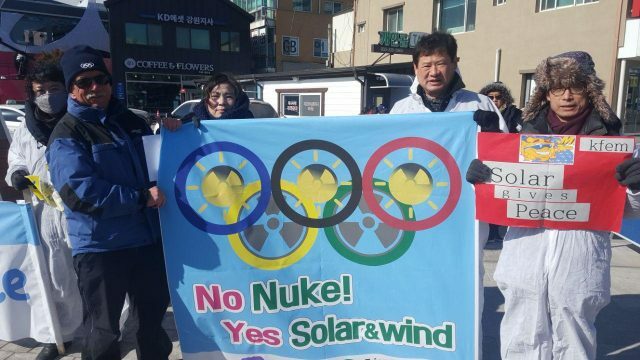 Fortunately, the Republic of Korea has also joined the ranks of energy transition from nuclear to renewable energy and gave up the construction plan of six nuclear power plants last year. However, five nuclear power plants including Shingori unit 5 and 6, are under construction. So the risk of nuclear accident is not decreasing at all. In the Republic of Korea, which was an earthquake-safety zone, July 5, 2016, a magnitude of 5.0 occurred in Ulsan, and on September 12, a magnitude 5.8 occurred in Gyeongju. In particular, on November 15 last year, a 5.4-magnitude earthquake occurred in Pohang, resulting in 60 injured people and 1,500 displaced people, causing concern for the nation’s nuclear power plant. Ulsan, Gyeongju and Busan are active fault zones and have 19 nuclear power that is densely located. Local people in this region have had a great concern on danger of nuclear since Fukushima explosion. Looking at the Chernobyl accident and the Fukushima accident, we found that nuclear power plants were no longer safe and that economic efficiency was also lower than that of renewable energy. In the United States, Britain and Germany, renewable energy generation costs are lower than nuclear power plants. UAE Al Maktum solar power unit prices have fallen by 2.6 cents per kWh to world record. 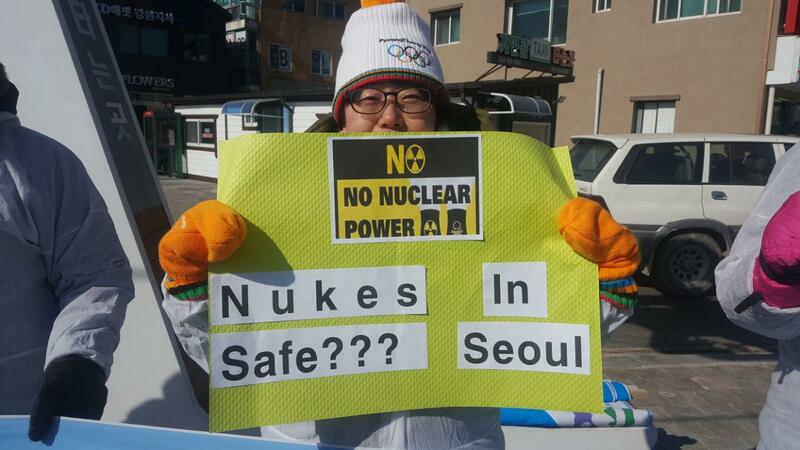 There are eight nuclear power plants in Korea with 30 years long. With insufficient preparedness earthquake and outdated equipment for an earthquake, safety is not secured. These aged nuclear power plants should be closed earlier than life span in order to relieve public anxiety. Renewable energy is a blessing that nature gives us. 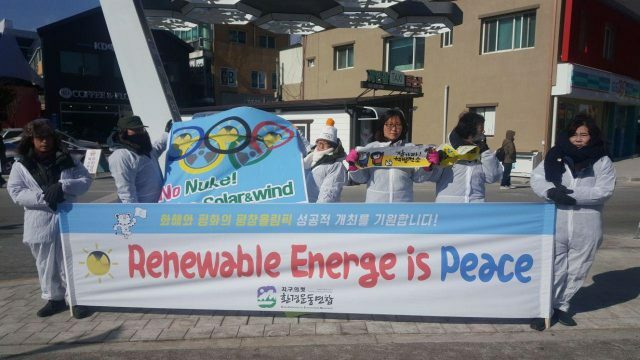 Korea accounts for only 1.5% of renewable energy generation among OECD countries. Efforts should be made to expand renewable energy. In addition, Korea consumes almost twice as much electricity per capita as developed countries such as Germany and the UK. We, the nuclear free committee of the KFEM, strongly urge the government to make the policy in raising electricity prices of large companies that are using below the cost. Saving is the fifth power plant.